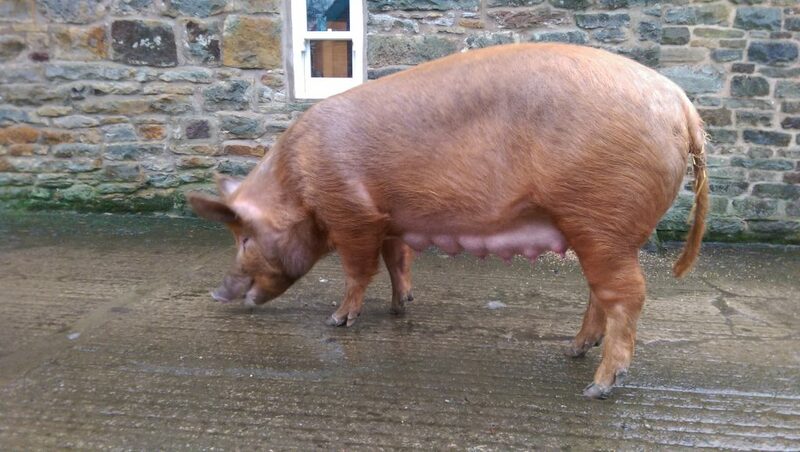 Everything had been going according to my rough plans so it looked like the next farrowing would go smoothly. As usual there is always something that can go wrong and experience tells me that it probably will so it becomes an exercise in looking for the positives. 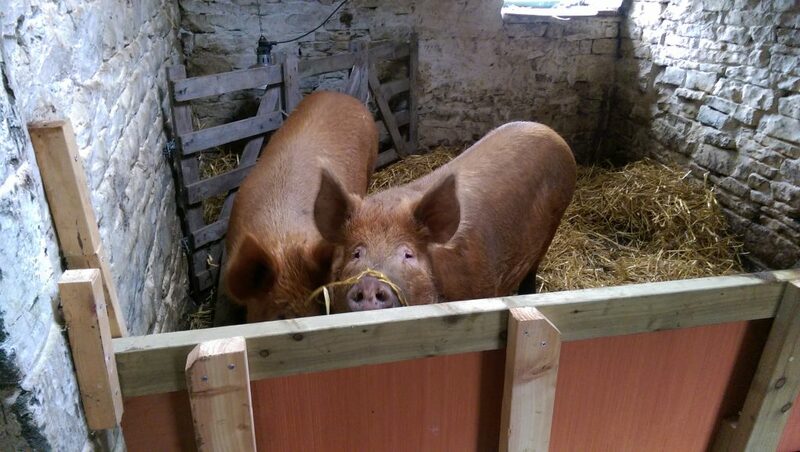 About a week ago both sows were brought in to the farrowing shed near the house to get Sissy settled and then a day or so later Esther was moved back to the woods to her usual home. Changes in surroundings are less stressful for a pig when it has company and we wanted to avoid any stress in the final days before Sissy farrowed. I’m told that it seemed to be a normal quiet Thursday afternoon and then suddenly by about 6pm there were piglets everywhere. In the end she had a litter of 11 which was a huge increase on her first litter. However, unlike last year when all 5 piglets survived, this time at least 3 piglets were already dead or very close to death at birth. Even though we know that this is always a possibility with every farrowing, it’s no less upsetting but Sissy didn’t seem to notice – especially as she kicked/squashed 2 more piglets over the next hour or so. Eventually the situation calmed down and we could relax knowing that the remaining 6 piglets were suckling well and looking very strong. 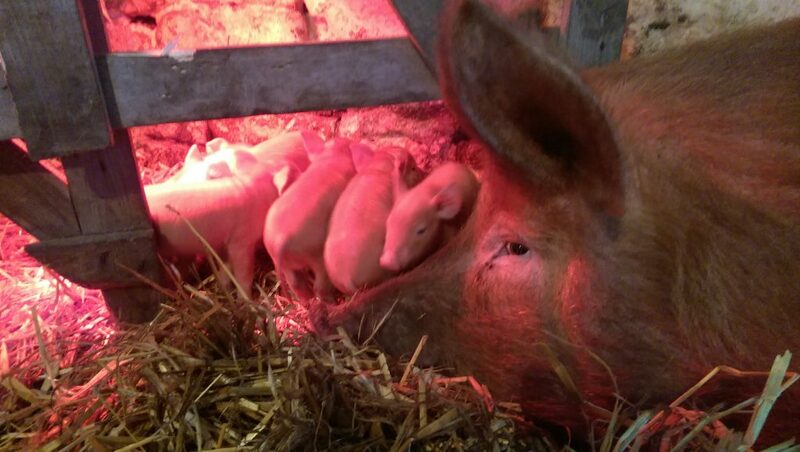 Sissy seemed to adjust to motherhood again after the trauma of farrowing and, as with last year’s litter, proved to be a very attentive mother from the second day onwards. She always welcomes a break from the shed though and is happy to wander around our courtyard snuffling for any unexpected treats she can find. It’s good to get away from the kids now and then. Wonderful stuff about the pigs. Sissy wandering happily snuffling in the courtyard is lovely to see and imagine. Our Dalmatian, Patch, sneezes when he sees us after a while…communicating I am sure. He is partial to a bit of toast . Some brown birds and little colourful salamanders arrive regularly…but otherwise not much wildlife. Will continue to read your news with interest.